The quilt show in Paducah was great fun. I still have one more week to play before I get back to Alaska. I am including my purchases from the most incredible quilt store, Hancock's of Paducah. There is a real quilt hanging in the store for almost every kit you see in the Hancock's catalog. The warehouse side...a small section open just during the quilt show week. Boxes of fabulous kits and precuts. This area changed everyday so we had to come at least once a day. I wanted this quilt kit most of all...got it on a day there was a 20% coupon off one item...SWEET! The designers of the quilt, "Fourth and Sixth Designs," have a wonderful 45 minute YouTube video on their construction method. Can't wait to try it. This stunning batik quilt caught my eye so I had to get the kit. My quilt show companions, Corrine and Christelle, bought the kit also. The pattern is, "Eldorado Canyon." And I bought one more kit...though I mainly bought it for the fabrics which might be used in another design. It was a good deal so I am glad I got it. Comparing the Houston quilt show and the Paducah show...both have their pros and cons. Paducah is a sweet town that really welcomes the quilters. I only bought three pieces of fabric from show vendors, the rest all came from Hancock's because they beat everyone's selection and prices when it came to batiks. The Paducah convention center is small so many other sites around the town host vendors and quilt displays. The only thing I didn't like about the show in Paducah was how tight the space was for viewing the quilts. Houston definitely has the advantage of great space and everything related to the show is in one building. I'll share some photos of my favorite quilts from the show later. I didn't get to see them all...the space was so crowded and difficult to move around and it was tough to see the quilts well. I'm back! We did a quick trip to Lanzarote, one of the Canary Islands. 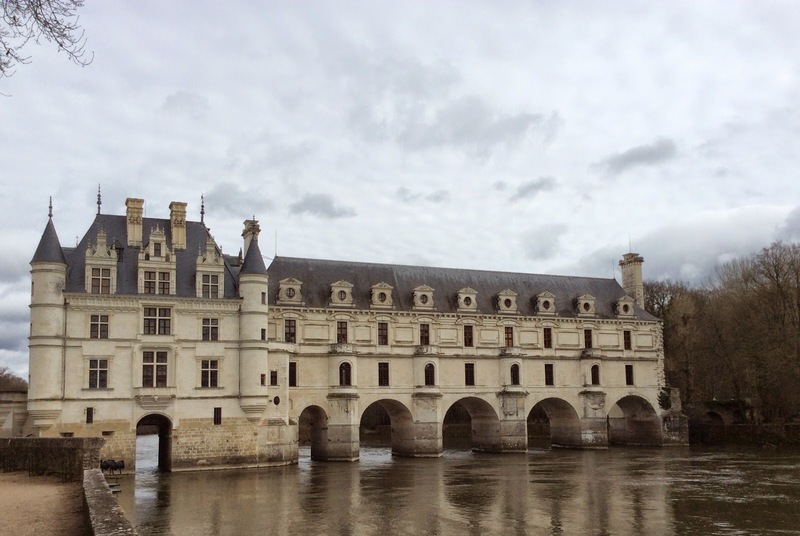 We had no internet so my final blog post on the tour of the chateaux of the Loire Valley was delayed. We started day two with a stop in a town with cave dwellings. I think this must be a more popular visit in the summer time as it was really quiet the morning we walked around. The dwellings looked tiny but some were cute. I read most are just one room with cool temperatures year round. Great for wine storage. Christelle will have to help me with the name of the this town...as there are several towns throughout France with cave dwellings. A fun note...these are called troglodyte dwellings which for me congers up images of a dwarf population...too many viewings of the, "Lord of the Rings," trilogy. 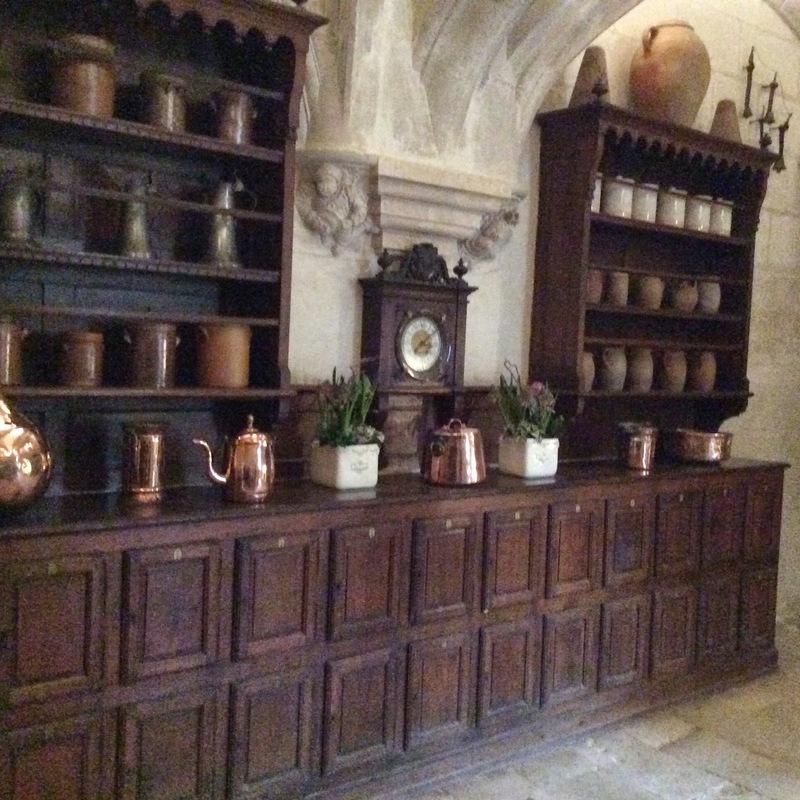 Then we were on to the one and only chateau visit for the day, Blois. 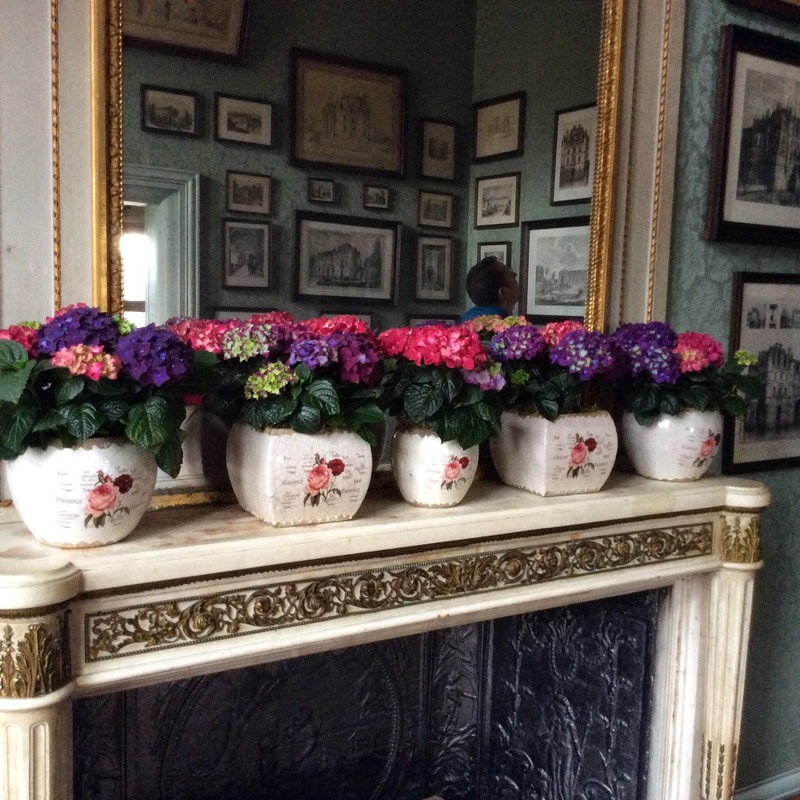 A lovely dramatic entrance. This is Louis the XII. The chateau underwent different phases of construction. One of the earliest phases is marked on the exterior by the red brick mixed with the white stone. I believe this was a queen's chamber. 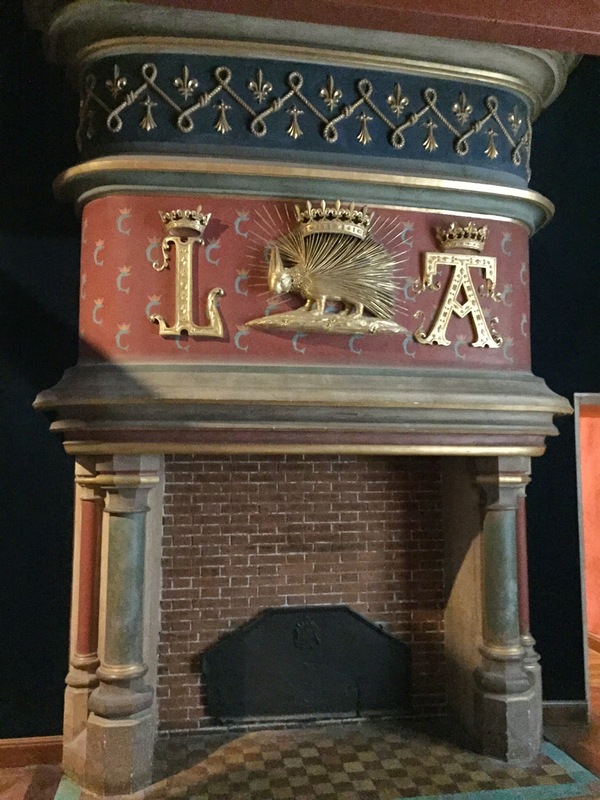 Every fireplace had a huge royal emblem. 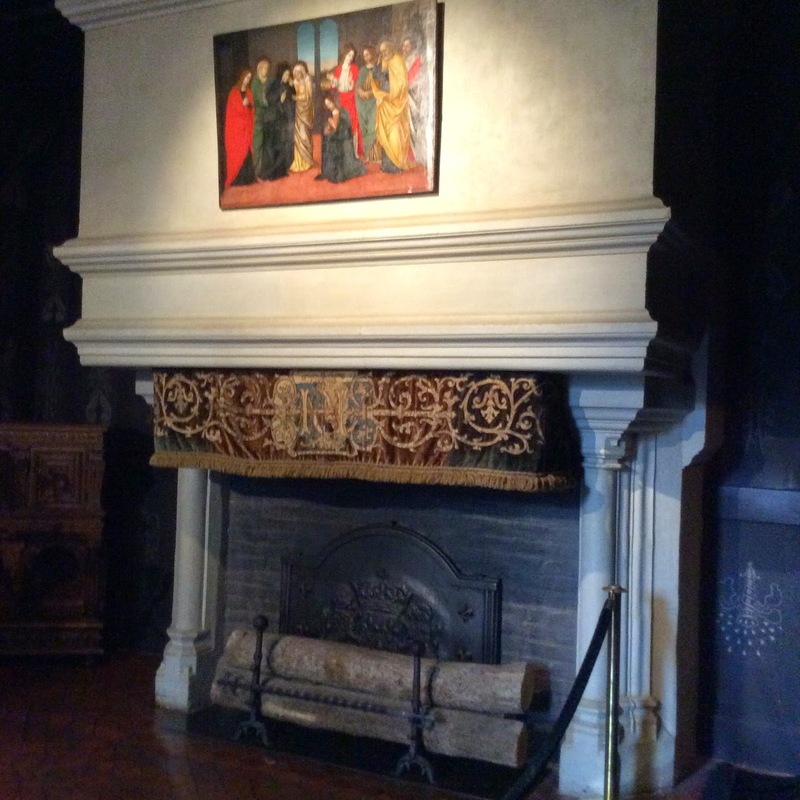 Many French monarchs lived in Blois and left their "mark." This is the monogram of Henry II. Another royal bedroom, this one belonged to a king. There is a big "H" in the tile floor for Henry III. The white stone exterior was introduced by Louis XII. The porcupine became the symbol of Louis XII when his father, Louis the XI created the order of the knights of the porcupine for his son on his baptism. There is always some bad blood among the royal court and the porcupine's quills are pointing in every direction at the family's enemies. 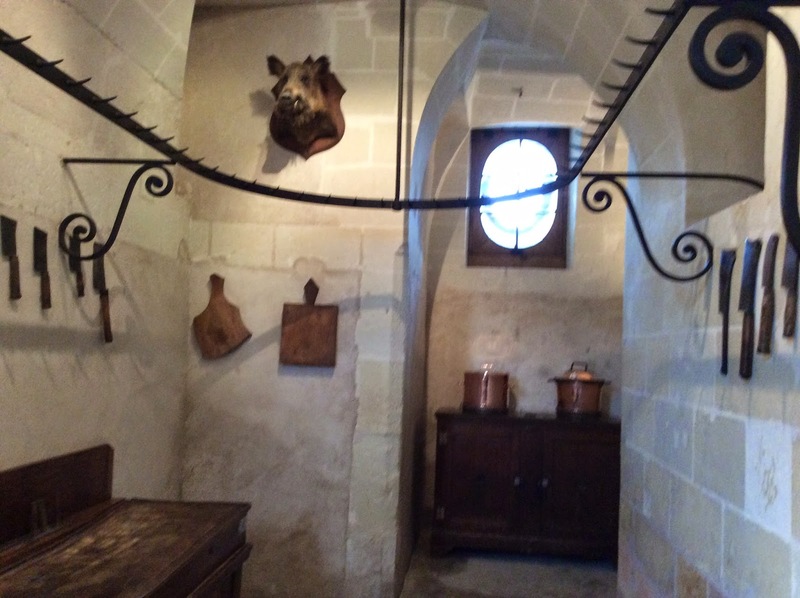 There was a familiar feature added to the chateau by Francois I...an exterior spiral staircase...very much like the hunting lodge, Chateau Chambord. 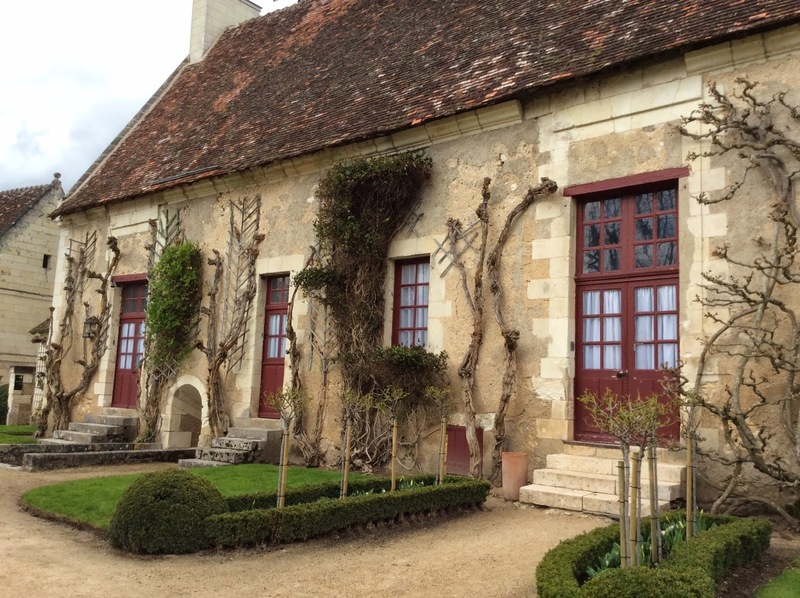 This chateau has many furnished rooms. 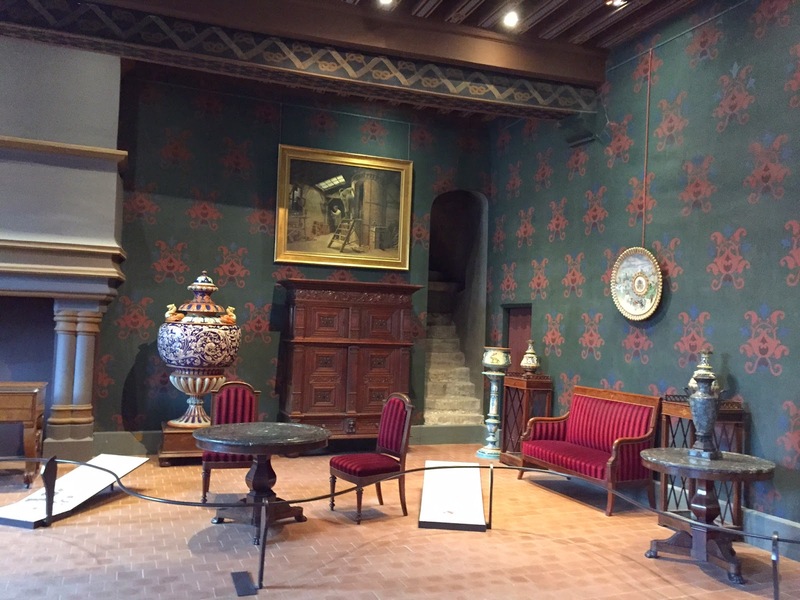 Some of the interiors reflect later time periods...some as late as the 19th century. 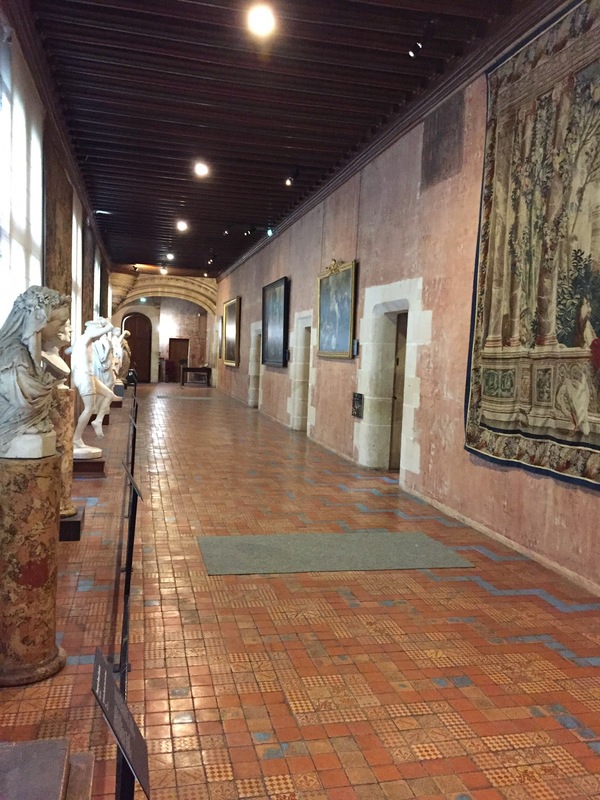 One of the wings hosts an art gallery with several small rooms off this hallway. We had lunch in the adjoining town which crowds right up to the base of the chateau. And our grand chateau tour came to an end all too soon. I am leaving tomorrow to meet up with the French Quilting Contingent. We rendezvous in Atlanta and will go on a road trip to Paducah. I will try to share our adventure! 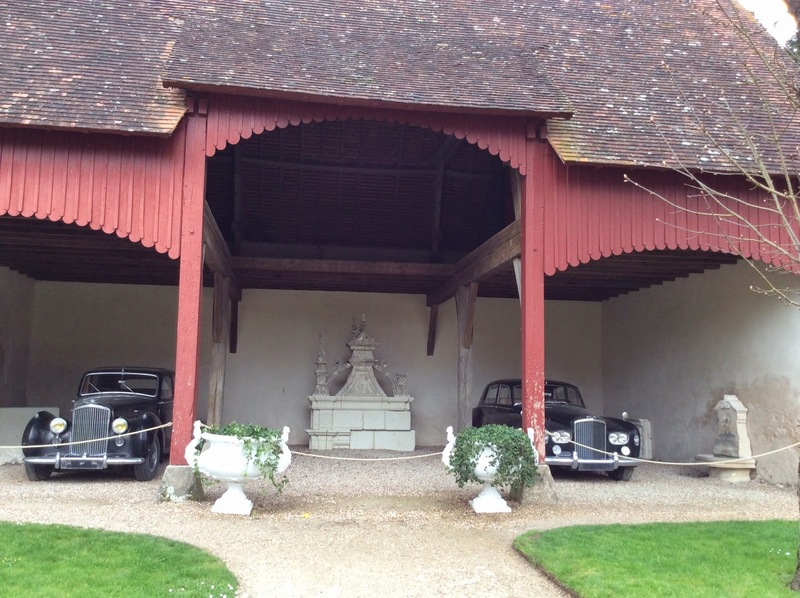 Adjacent to Chateau Chenonceau was the support village. 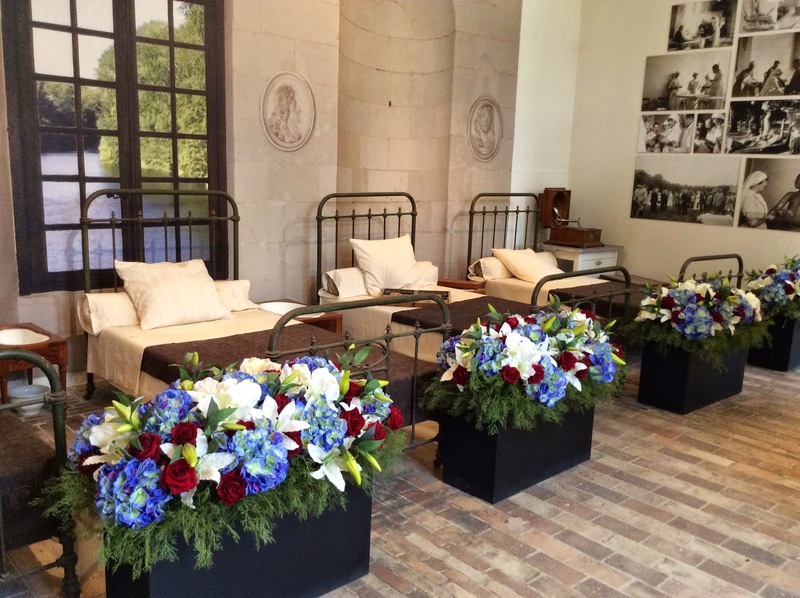 A mock-up hospital ward was set up in a building like it would have looked in WWI when the chateau served as a hospital. 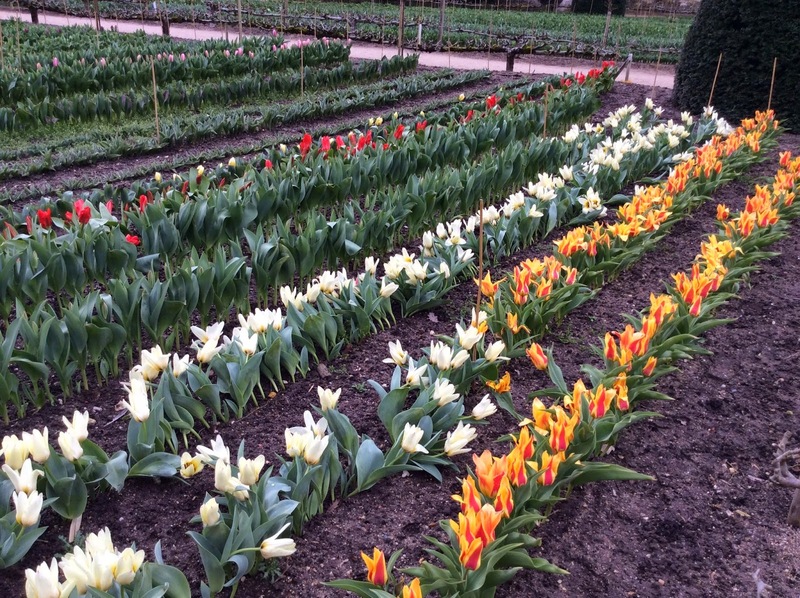 More gorgeous flowers. 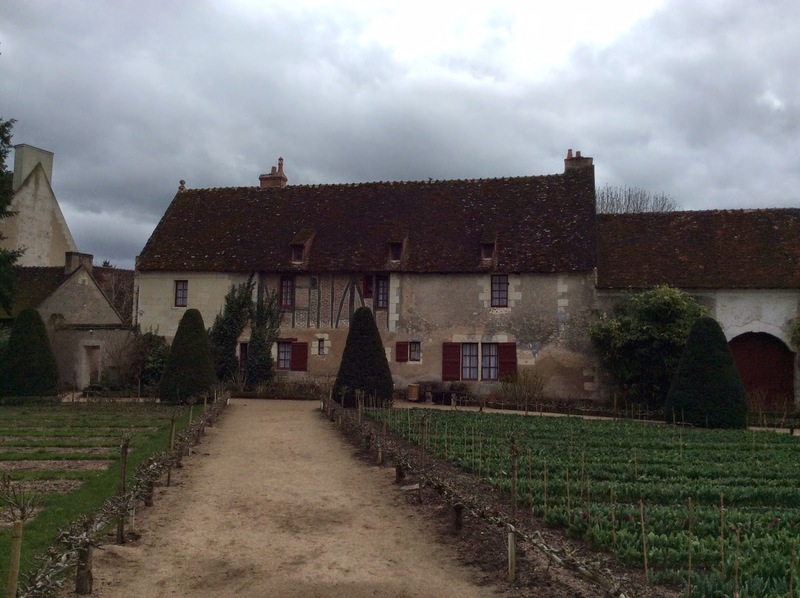 It was towards the end of the day when we walked through this part of the chateau estate. No people around. 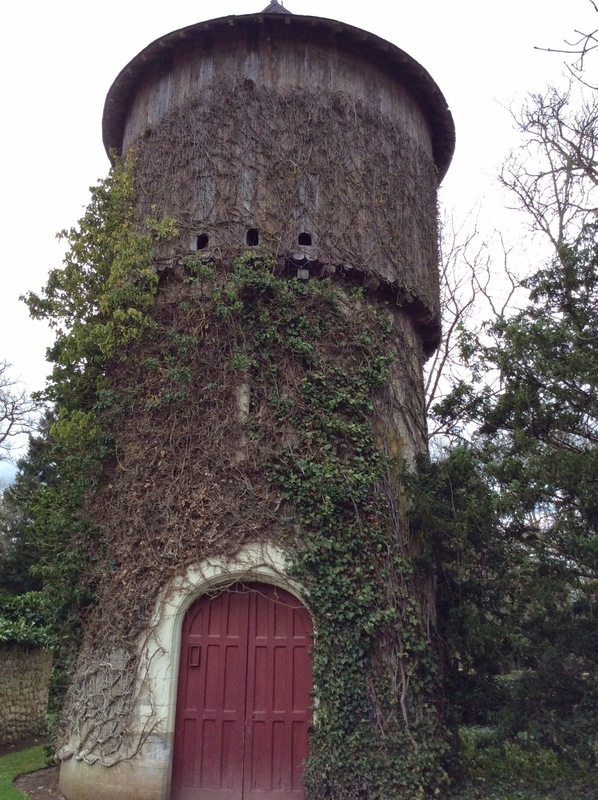 Looks like a tower from a nursery rhyme. 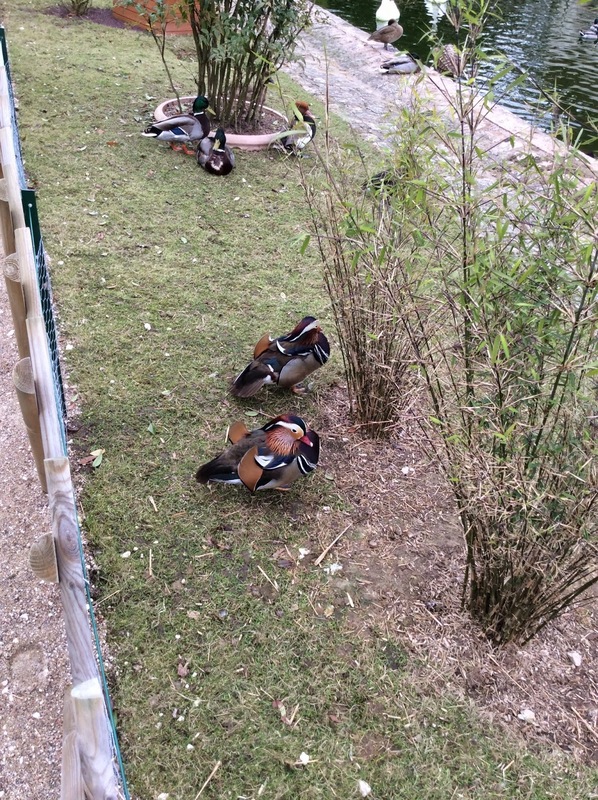 There was a fabulous little duck pond. I had never seen this breed of duck...perfect colors for my Alaska house. In keeping with the WWI hospital theme...vintage auto garages. Behind the little village were large gardens. This must be where they get some of those beautiful flowers for the chateau. 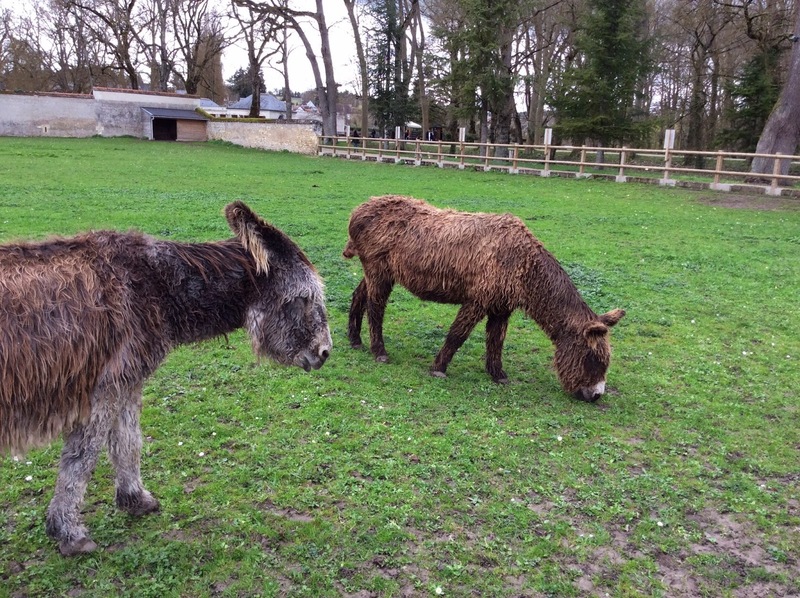 And some donkeys to cart all that "stuff." I do wish the weather had been a bit sunny but at least we weren't having rain. One more chateau in the tour. 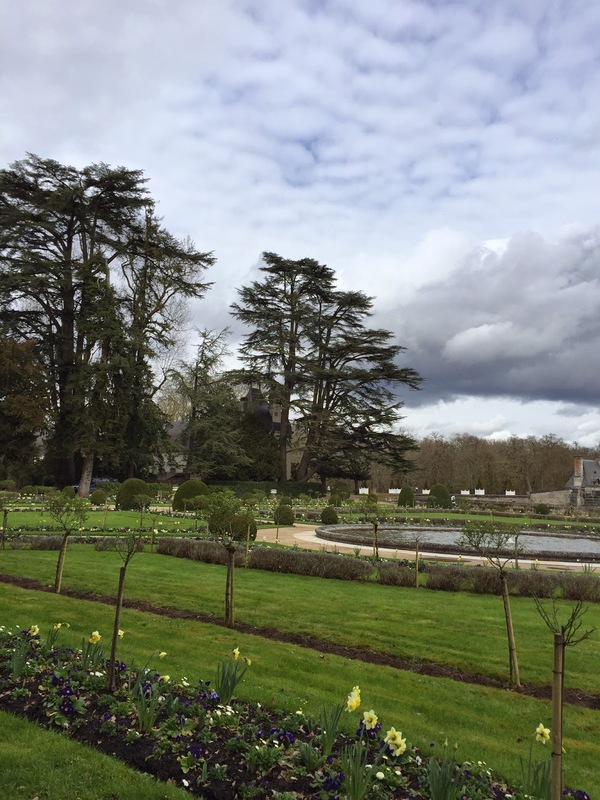 A view from the other side of Chateau Chenonceau. Looking at the above photo, on the right side of the river there are two lovely, huge gardens. The blooms were just getting started with the spring weather. One side the color scheme was purples and yellows. You can just see a bit of the central water fountain. On the other side the garden was not as colorful yet but had a pink color scheme. 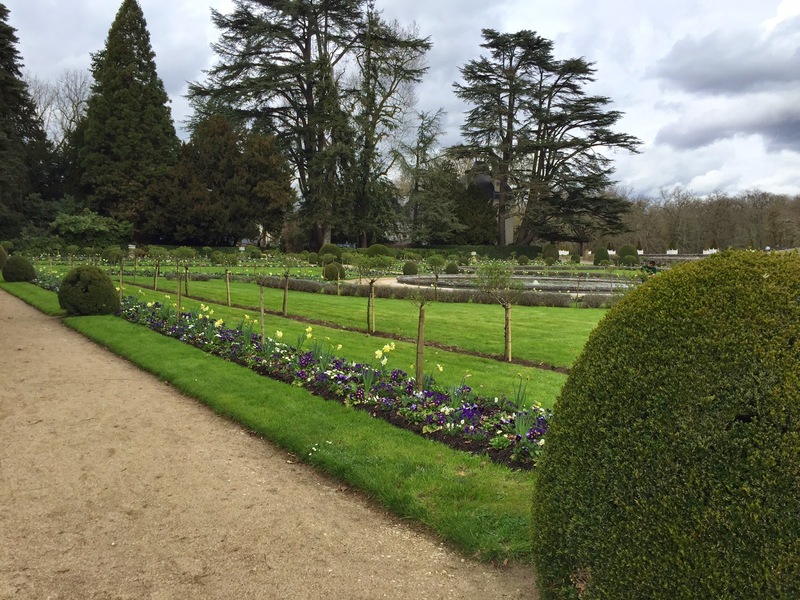 Maybe it was hard to tell in the previous photos, but these gardens are very large. 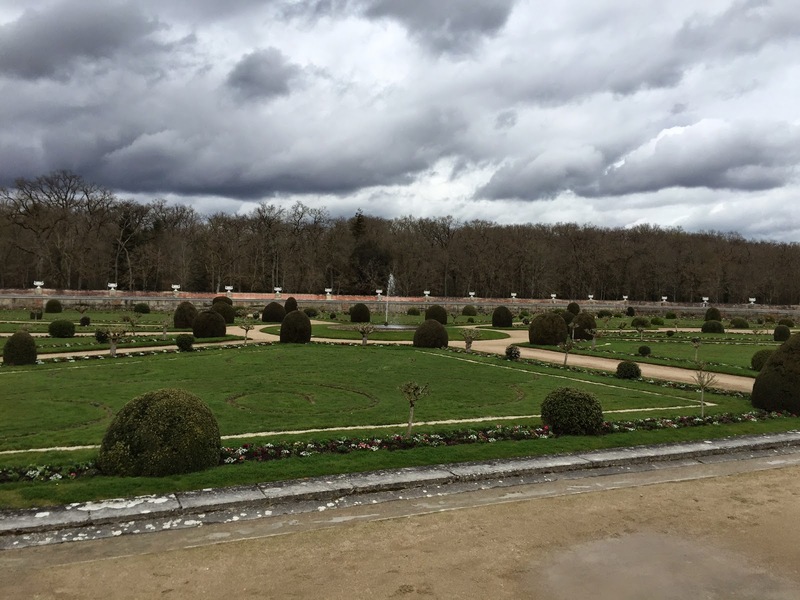 Catherine Medici, an Italian noblewoman married to France's Henry II, played a large part in the design of these gardens and many others at various French chateaus. I enjoy her gardening contribution to France! Catherine was queen of France from 1547 to 1559. I know she brought about the Jardin de Tuileries next to the Louvre and the fabulous gardens at Luxembourg Palace, both gardens in Paris that I have enjoyed visiting frequently. We couldn't go into the adorable cottage at one end of the gardens but we thought it looked like the perfect place to live. I don't always get someone to take a picture of me! 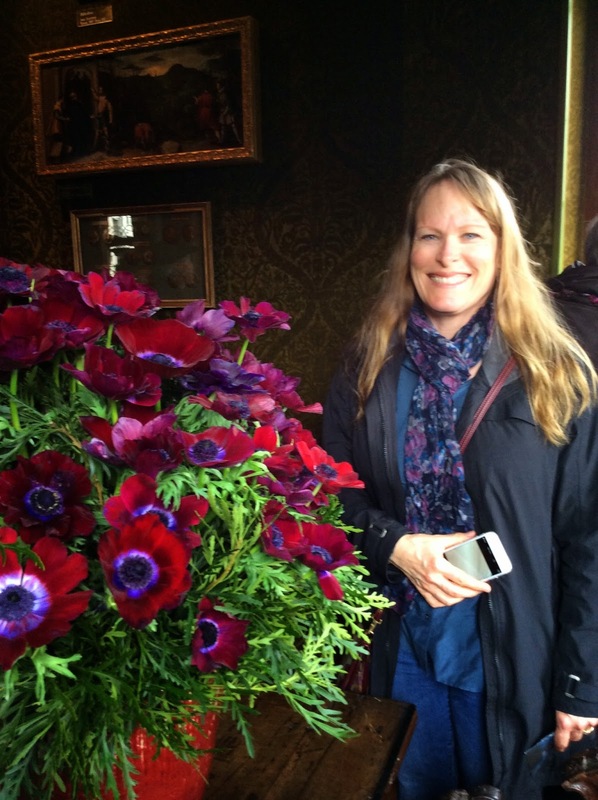 It is important for you to be able to see the size of this flower arrangement compared to me. Keep this size in mind as you view the rest of all the bouquet photos. 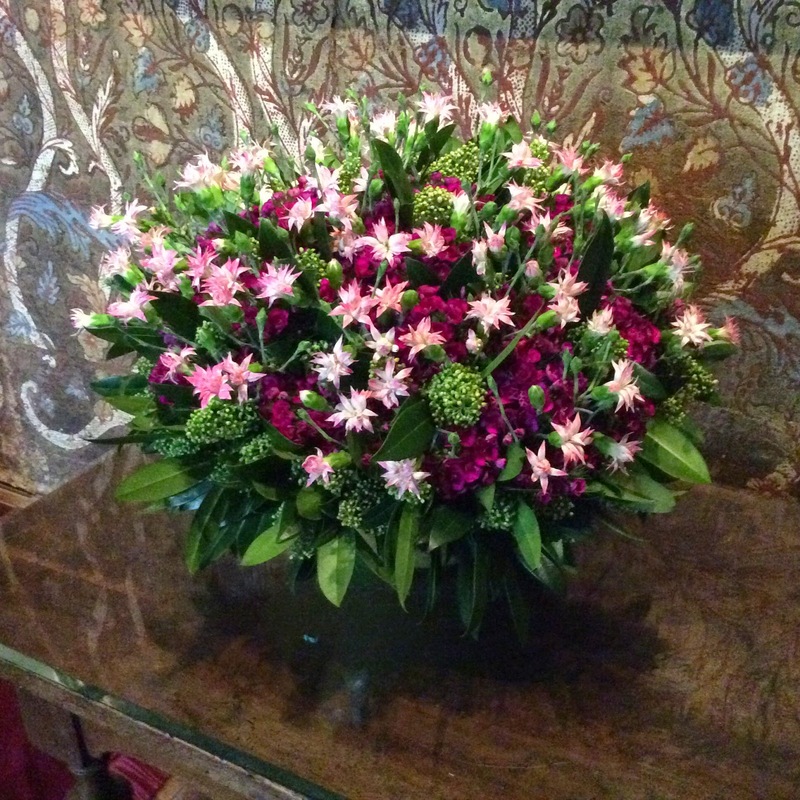 I guess I should warn you now...many flower arrangement photos ahead...ENJOY! 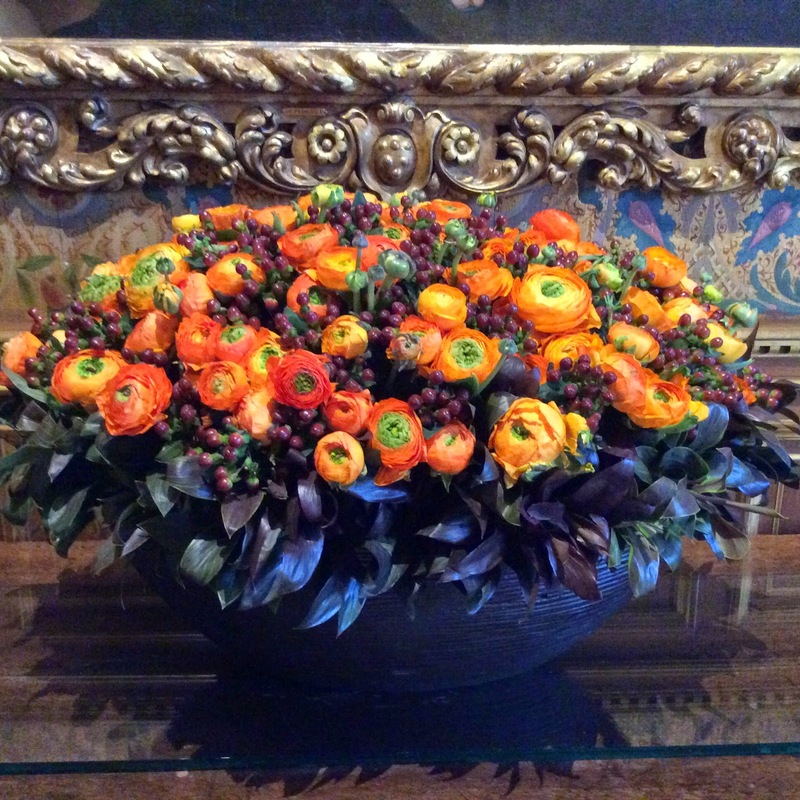 I loved every flower arrangement in this chateau. 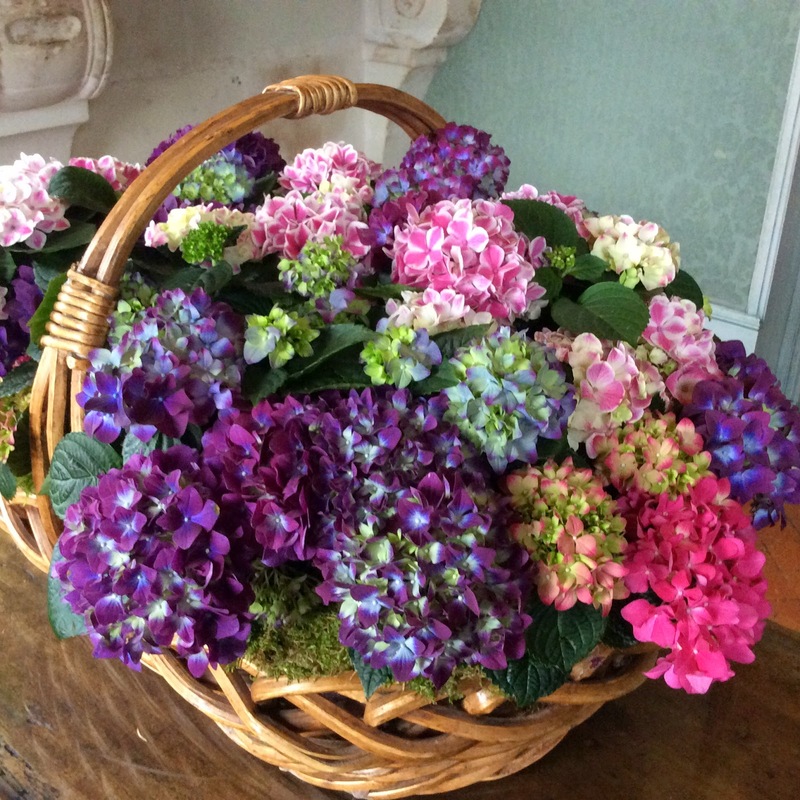 They were all made with gorgeous fresh flowers that sometimes looked too perfect to be real. Please note the warm colors of this hallway and the tapestry that hangs on the wall. 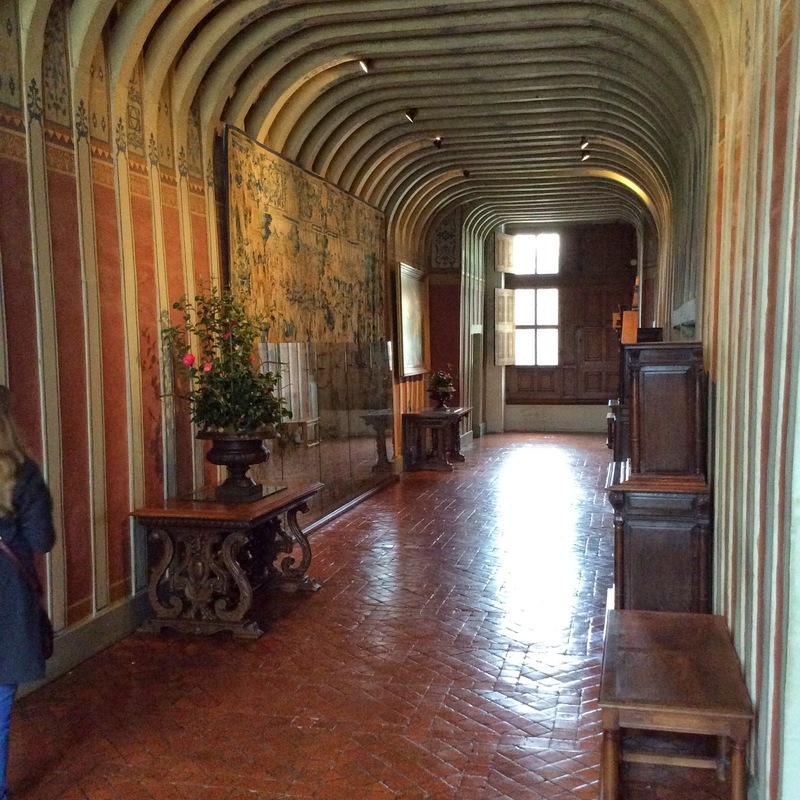 Every space of the public areas of this chateau was beautifully decorated. 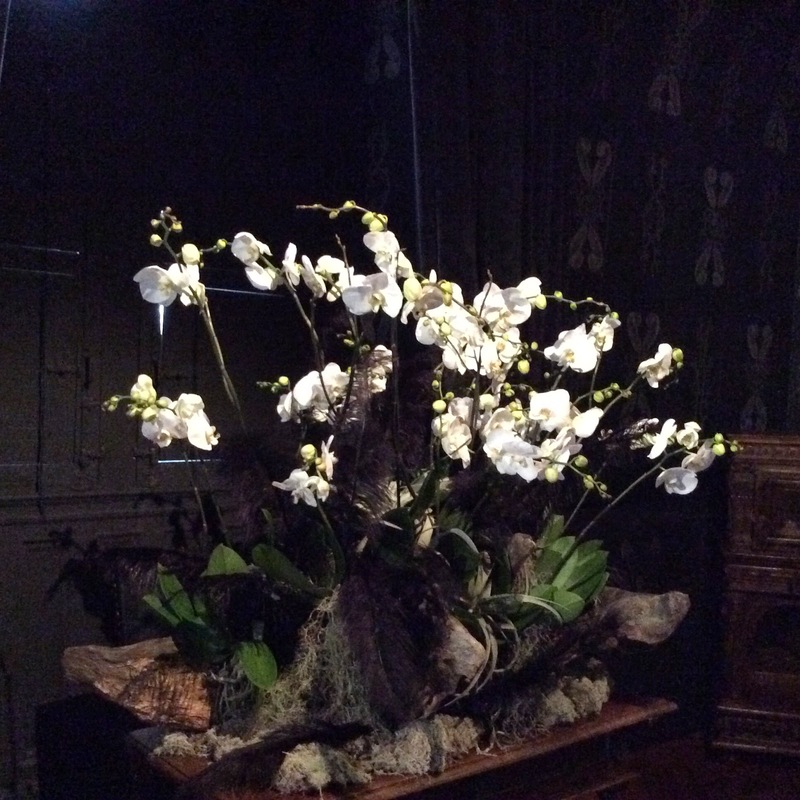 ...and a display of beautiful white orchids. 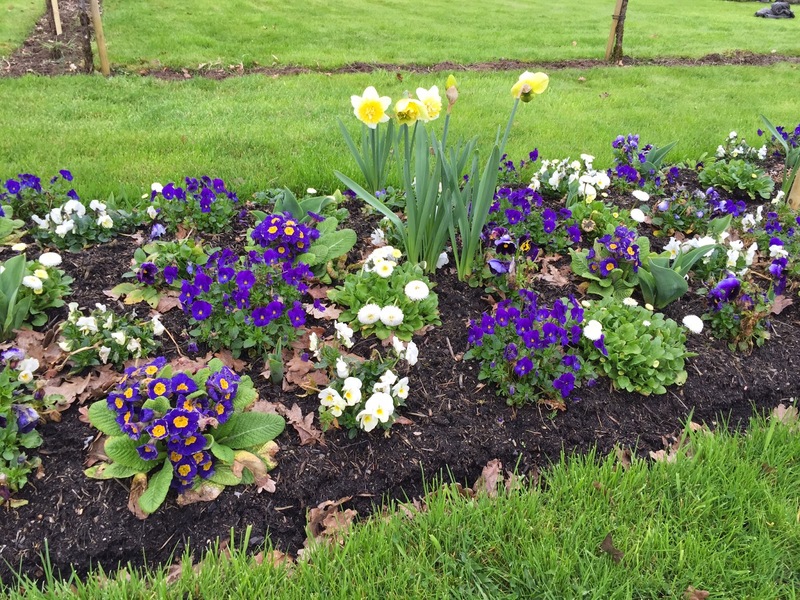 What are these flowers? 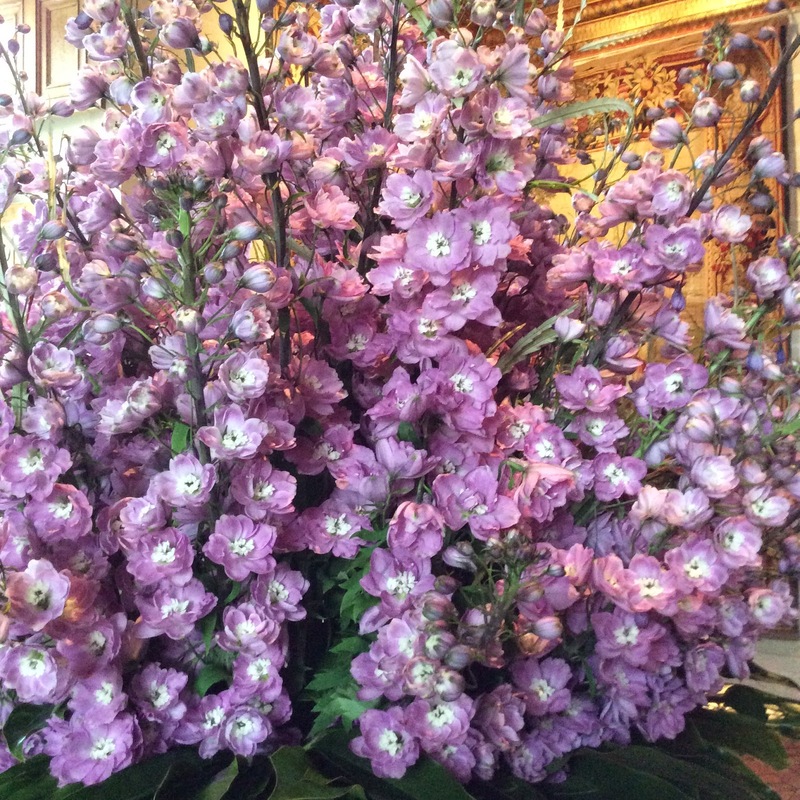 They remind me of delphiniums. 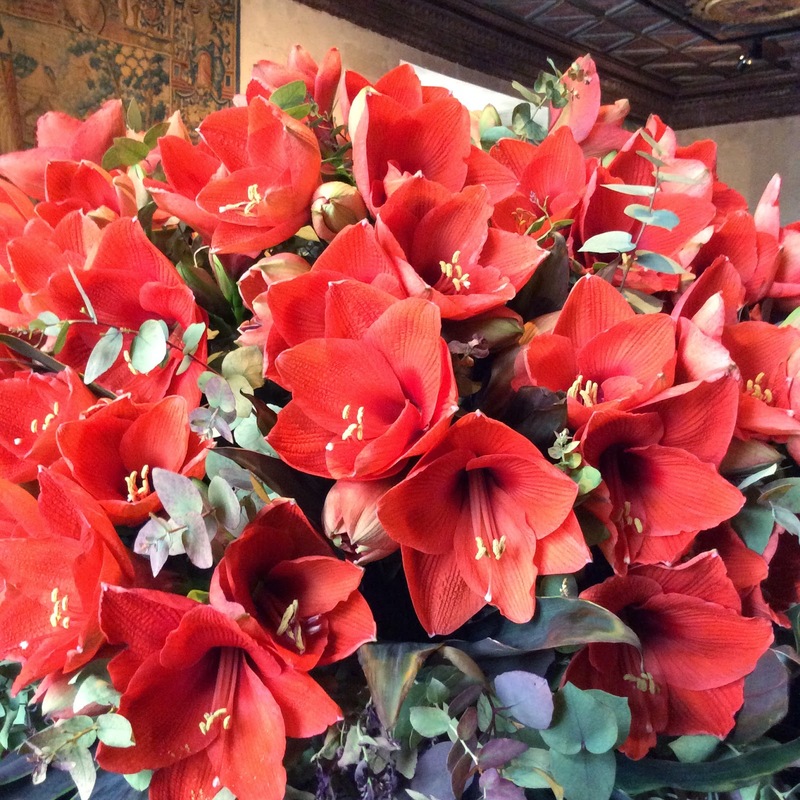 And we think these stunning flowers are Amaryllis. ...adjacent to this room with the same pale aqua wallpaper. And what are these flowers??? I know there are orchids in this basket but what are the bottle-brush shaped flowers with the lime green tips? 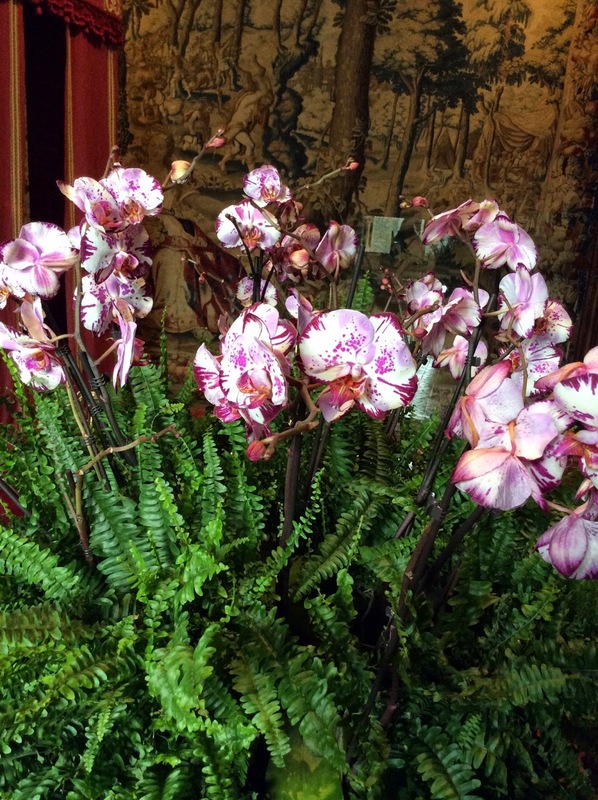 From this photo it is hard to appreciate the gigantic proportions of this cluster of orchids. A bedroom fit for a king. 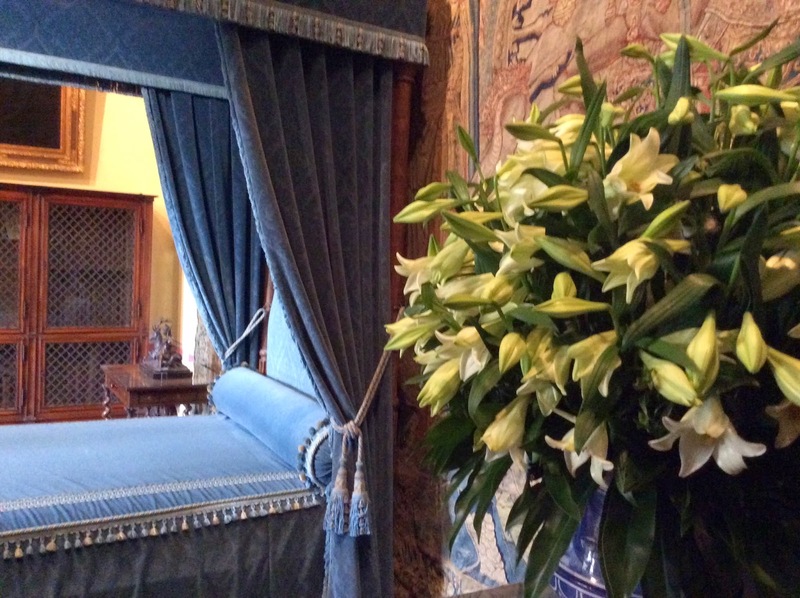 Hanging on the wall behind the lilies is a tapestry...many of the bedrooms were lined with wall-to-wall tapestries. It made me feel so cozy. And back to the first basket that I loved the most. I don't know what these are! 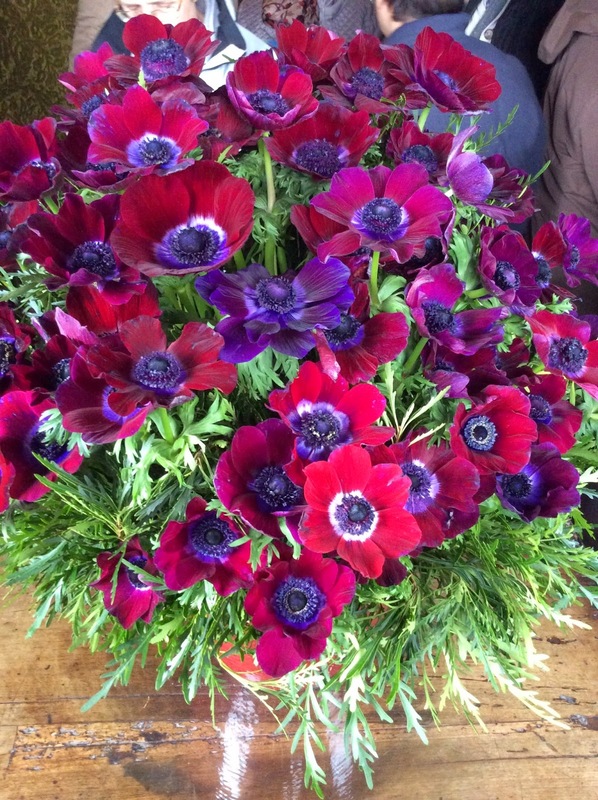 Are they anemones? My best guess! 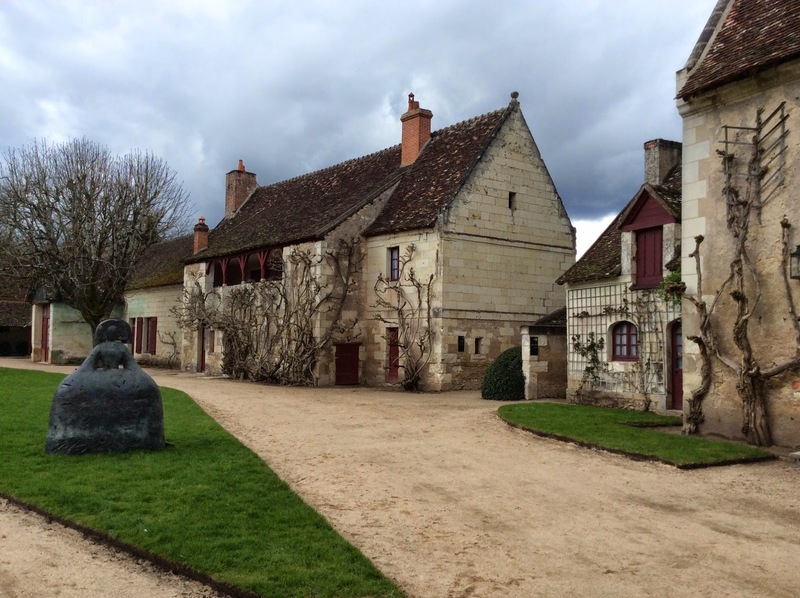 Where there is a chateau...there is a village that supports it....stay tuned for part III. 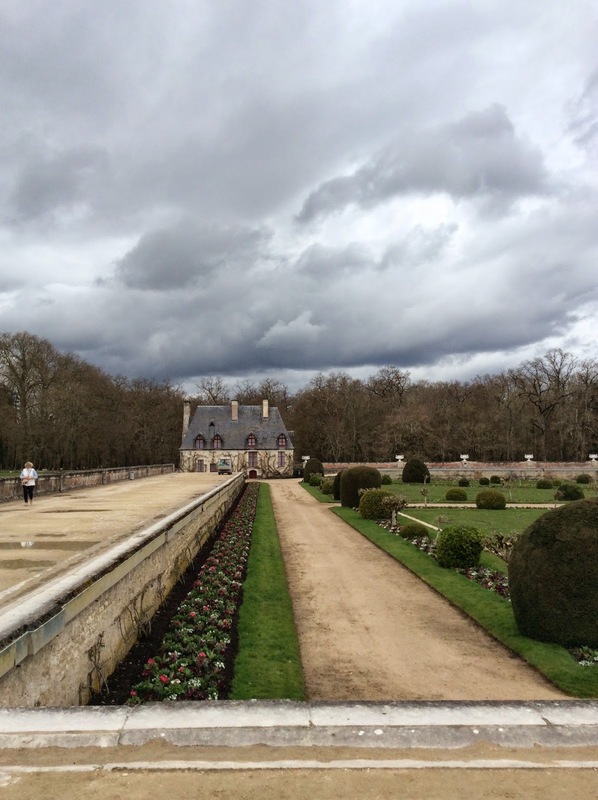 Chateau Chenonceau blew my socks off! It is getting three separate blog posts for all the photos. This bridge castle spans the Cher river. 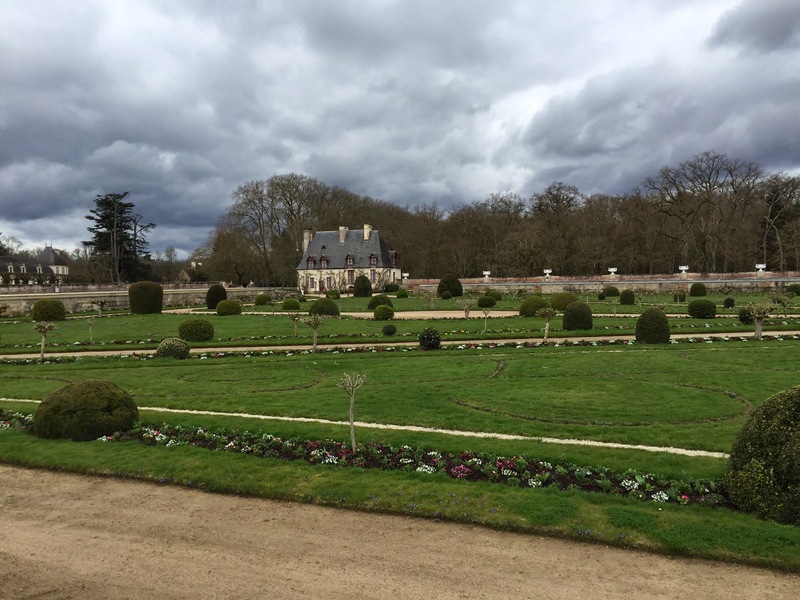 It served as the primary residence for a king's mistress and two queens, whom each had a major hand in the chateau's construction and design. The entire place definitely reflects a woman's touch. Immediately off the main entrance is a lovely small chapel. 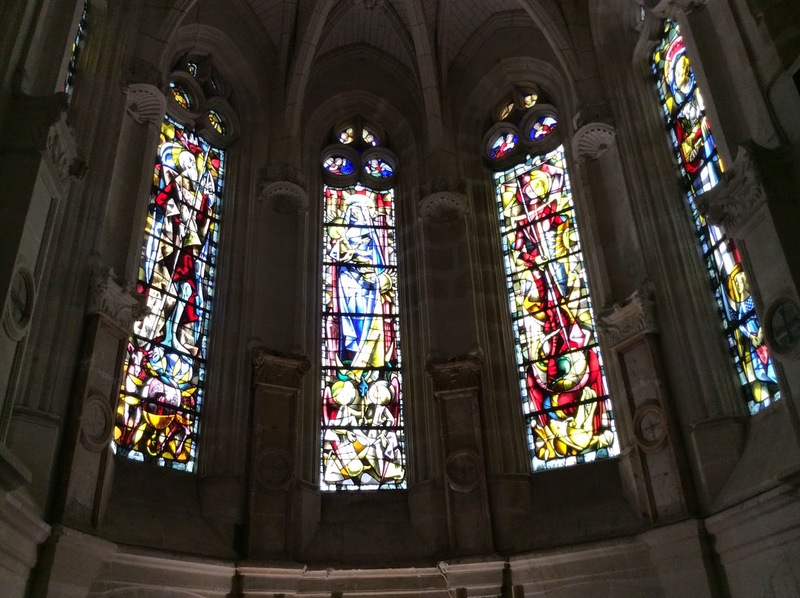 I just never get tired of stained glass windows...kind of like quilts! 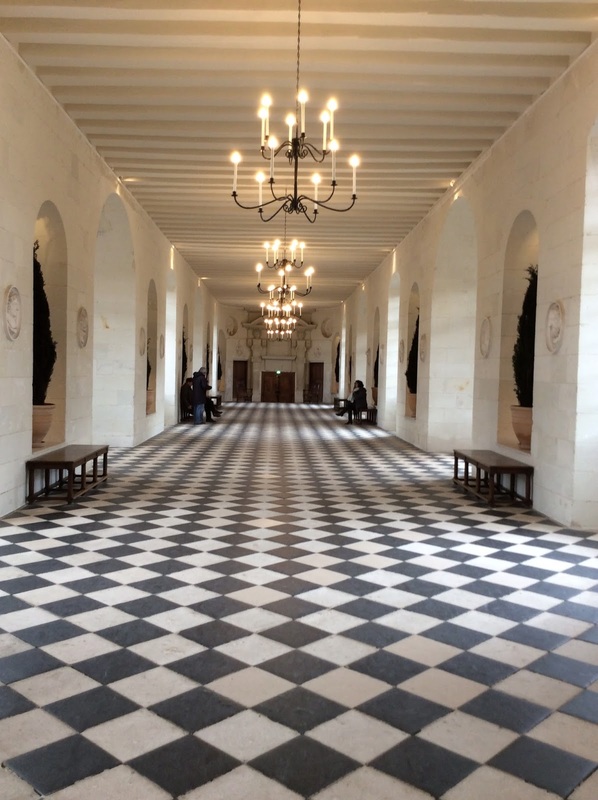 This gorgeous tiled hall spans the river. 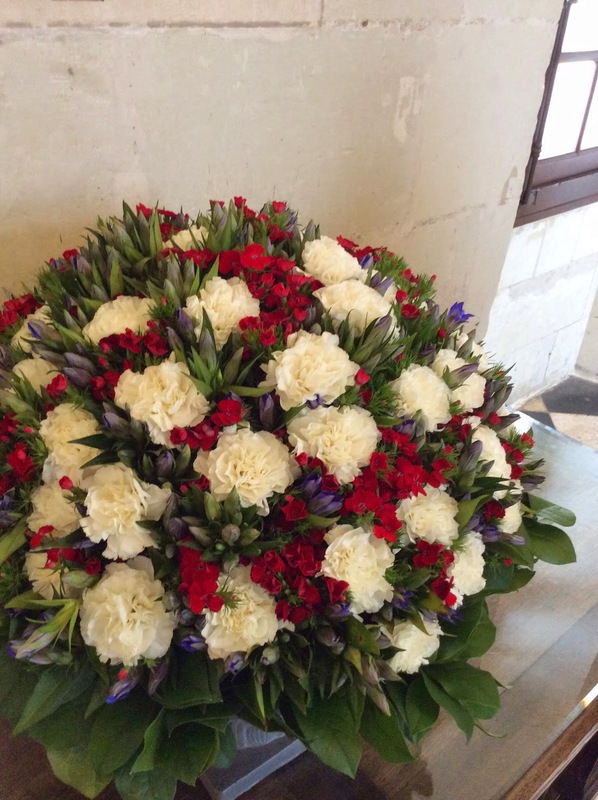 The first of many incredible fresh floral bouquets. 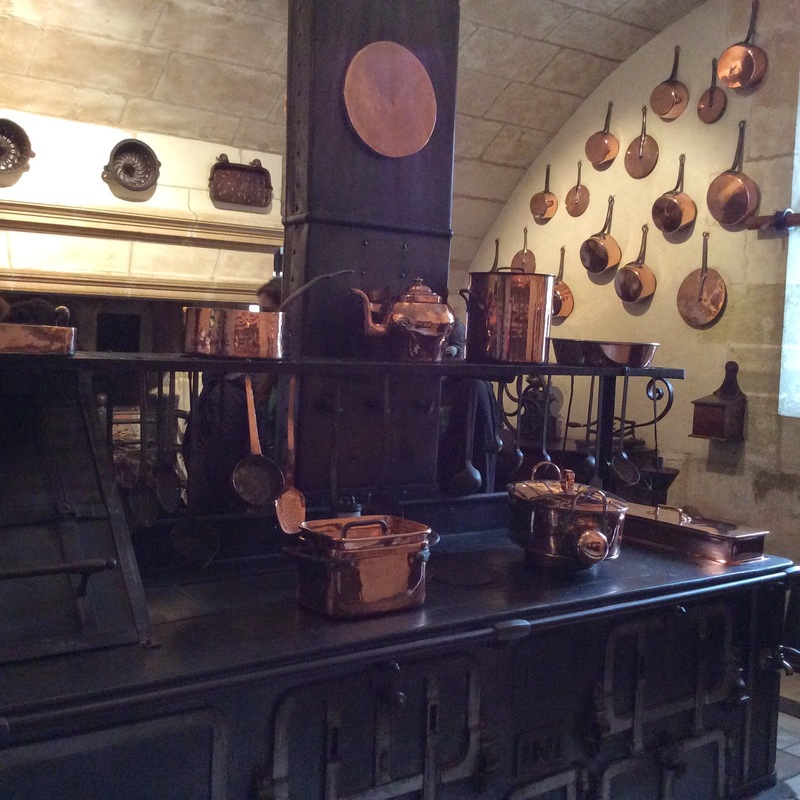 We hit a maze of several small rooms that served as the kitchen for the chateau when it was a hospital during WW I. This is part of the butcher's space. Hooks to hang the meat, knives easily accessible on the walls and a well-used butcher's block table. A fireplace...one of three in the kitchen. 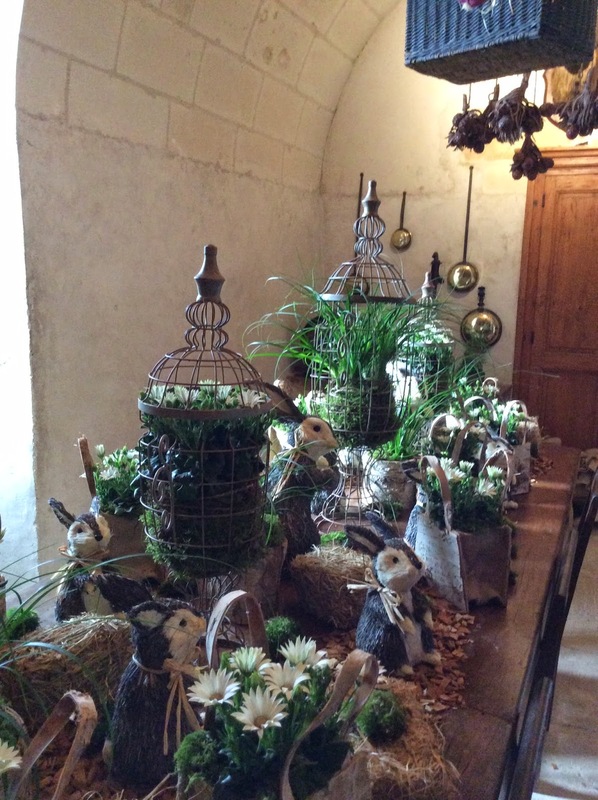 A charming work room...decorated for Easter and spring. 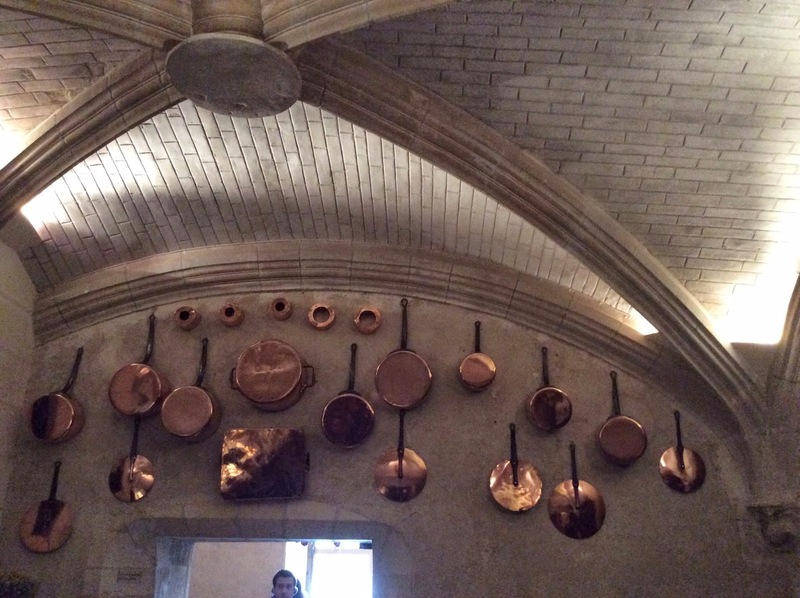 Just a few copper pots stored above one of the doorways. Look at the ceiling details. So charming. It was like walking through a fairy tale castle. Still in the same room. Another work room...also decorated for Easter. Again...the same small workroom of the kitchen. 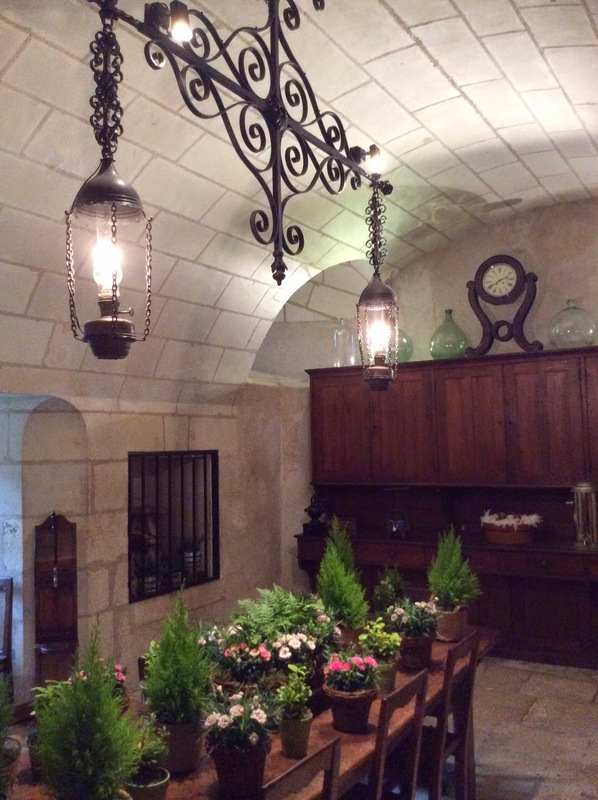 There were two of these rooms flanking the main kitchen entrance. 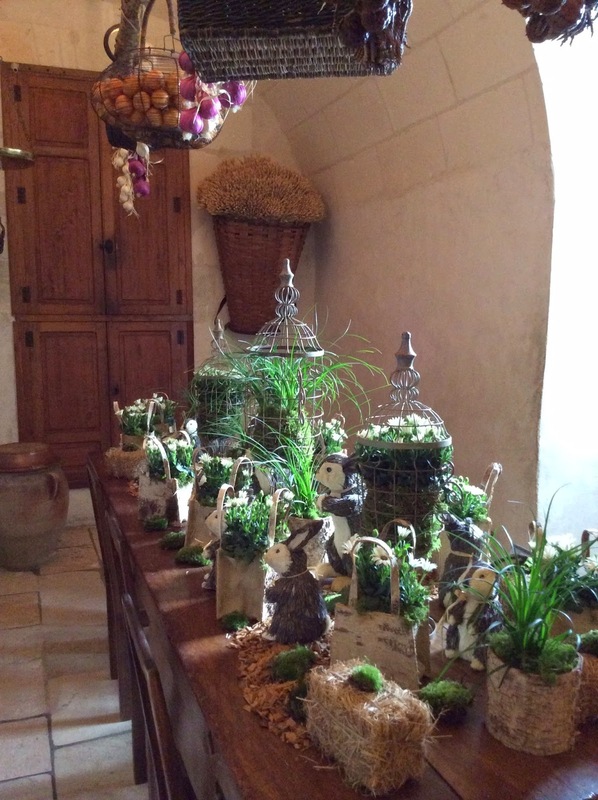 Maybe you need to see the Easter table decorations from another angle...adorable! 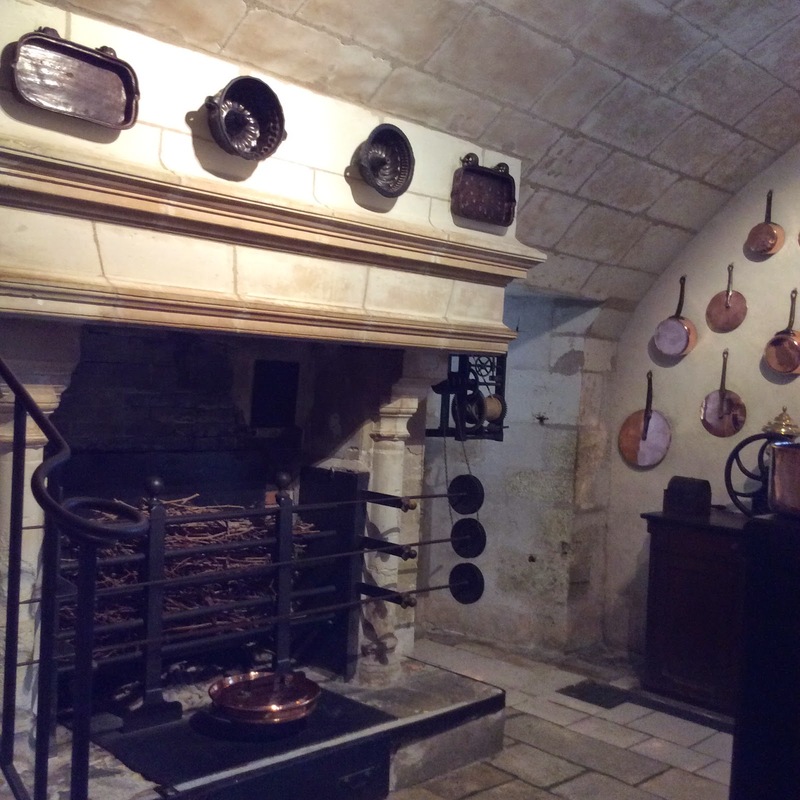 Here's the serious cook room...just enough room for this massive stove which was also brought in for use during WWI when the chateau was a hospital. 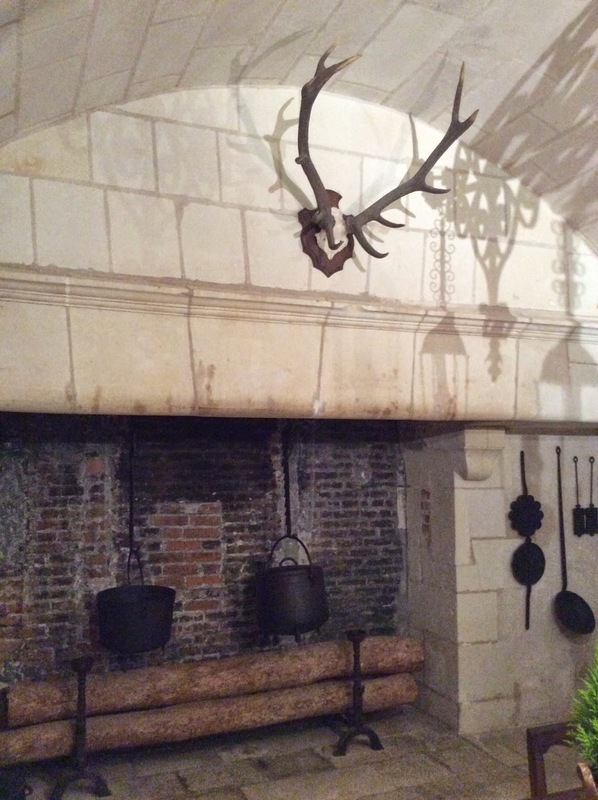 And a fireplace set up for roasting meat behind the massive stove. 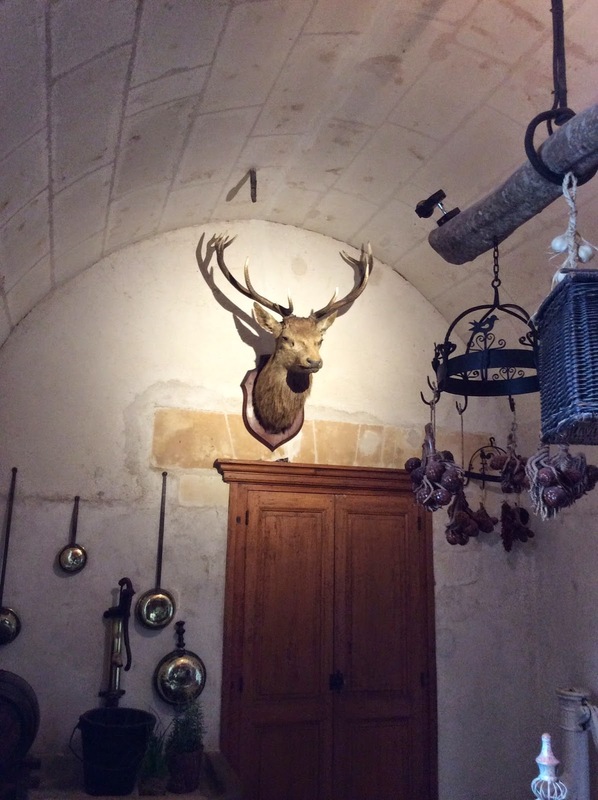 Then we were off to explore the other rooms of the chateau. 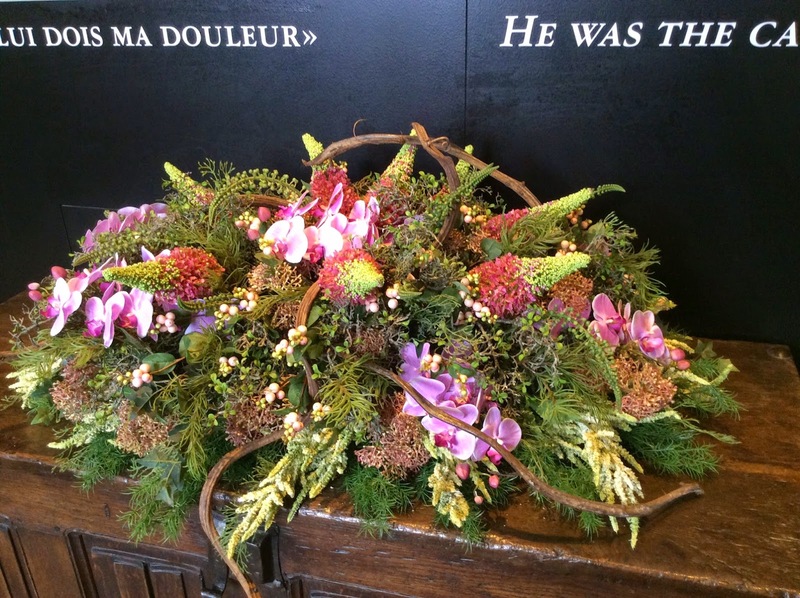 I hope you like dramatic floral arrangements. 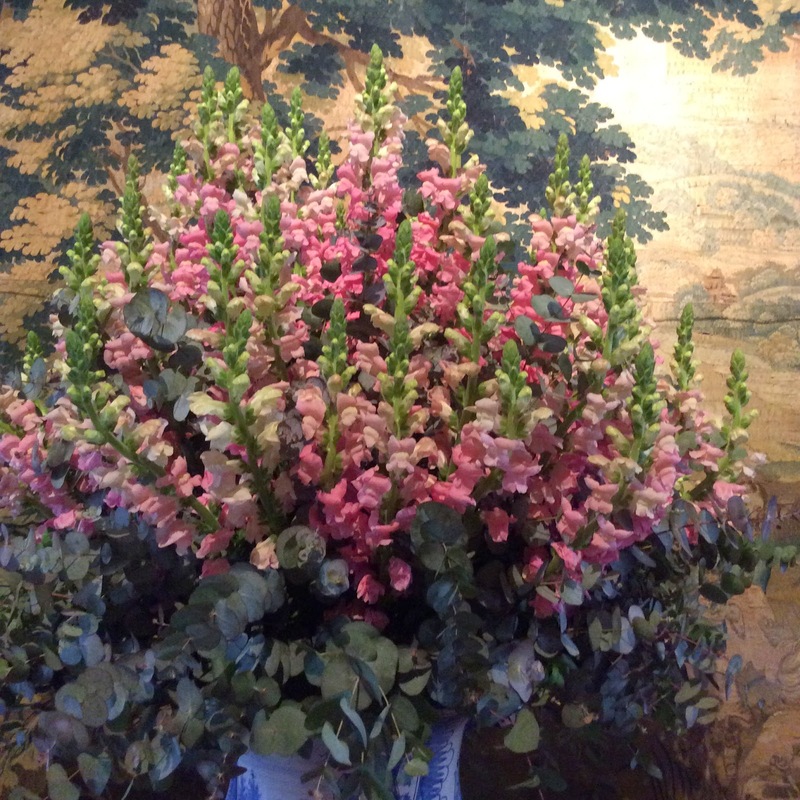 These photos just manage to capture a tiny bit of the effect these large bouquets had throughout the chateau. I would definitely spend lots of money on fresh flowers if my budget wasn't already dedicated to batik fabric! 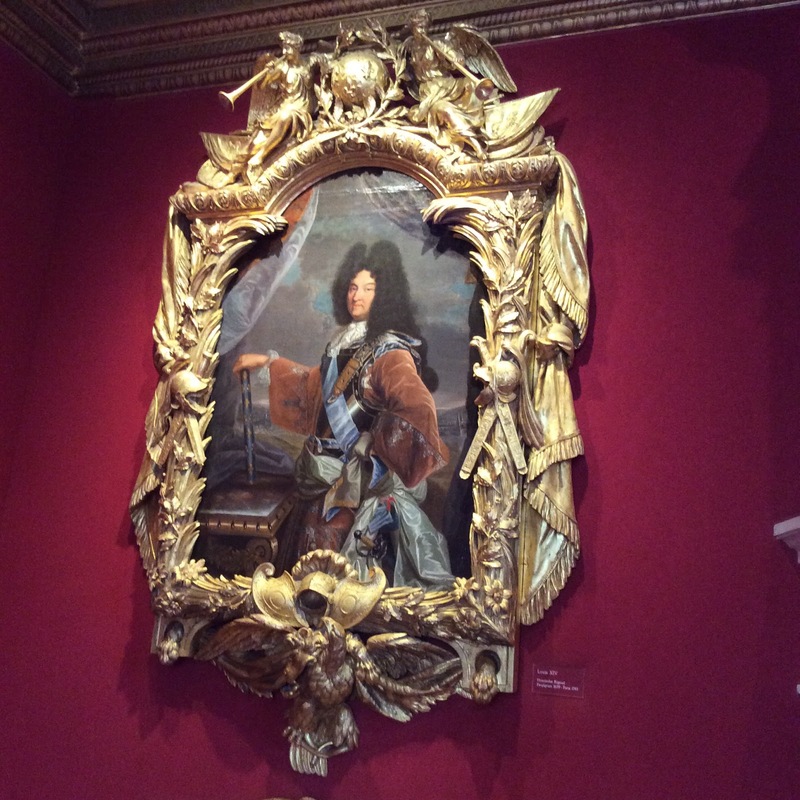 This portrait of Louis the XIV looks like it was stolen right out of Versailles. Even I have to admit it is incredible. A dramatic frame is as important as the quilting design to a quilt top. I thought it was special to have a dozen roses...nope...more like 80-plus in this arrangement. 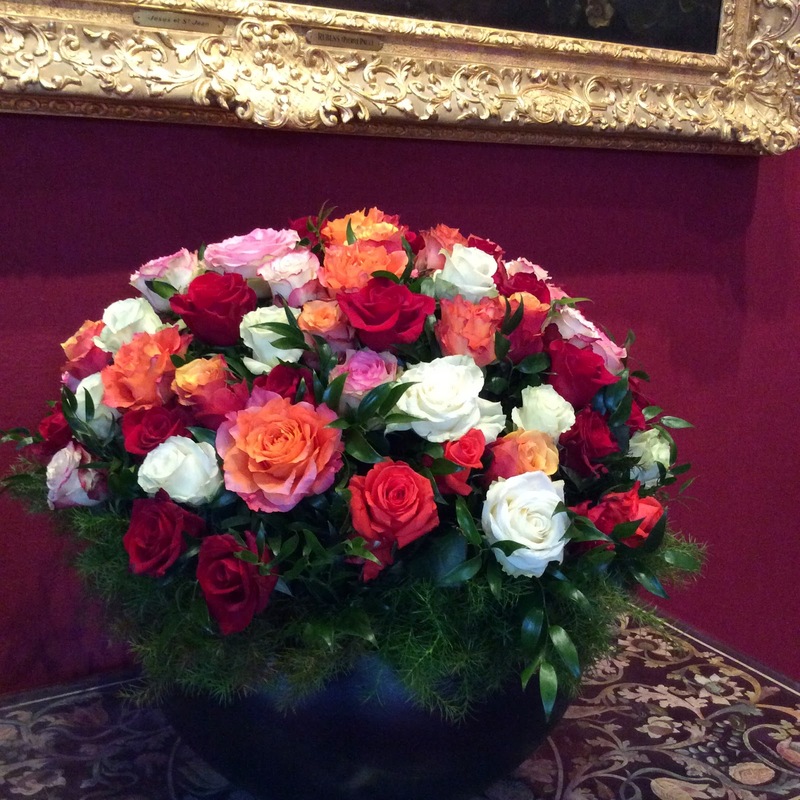 And they were large roses! Bigger is better.